The Dutch painter Johan Bartold Jongkind is seen as one of the forerunners of Impressionism. He left for France at a young age. His work is an important link in the transition to this style. The impressionist painter Claude Monet counted Jongkind as his teacher. "His painting was too new and too artistic to be appreciated in 1862 (the year Monet and Jongkind met for the first time). No one was as modest and withdrawn as he was. 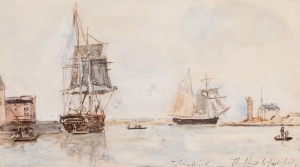 He asked if he could see my sketches, invited me to come and work with him, explained the how and why of his method, and thereby completed the lessons I had already received from Eugène Boudin." Because of his influence on French impressionist painters Jongkind is seen in France as a French master, although he was born in the Netherlands.